Everyone knows lip balm can soothe chapped lips associated with winter and cold weather, but why wait until your lips are already ravaged by the elements to offer them moisture? The best way to fight against winter-damaged lips is to protect them from the harsh environment winter brings, before you go outside. Custom lip balm is the best way to keep lips smooth and moisturized, even in the roughest weather. Winter can be tough on lips, leaving them cracked, peeling, dry, and sore. Even the simple act of talking or eating can an uncomfortable experience with lips that have been devastated by a day out in the cold. Damaged lips can be easily prevented with the daily use of a moisturizing lip balm. Love winter sports but hate what it does to your lips? The Custom Lip Balm store has a great selection of lip balm containing SPF 15 protection to help prevent the damage often associated with skiing, sledding, and other outdoor activities, keeping your lips looking and feeling great. We also offer SPF 15 lip balm and SPF 30 sunscreen combinations for complete care and coverage on the slopes and beyond! 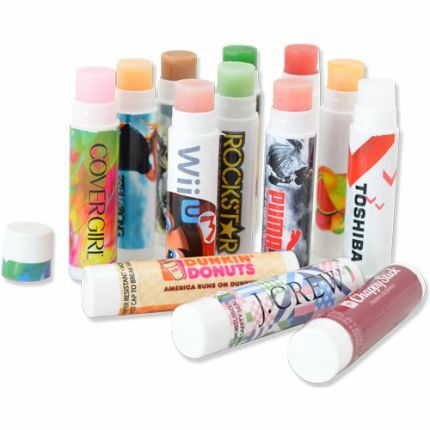 Custom lip balm is ideal for all your winter promotions and makes great customer handouts and leave-behind gift. And when it comes to lip balm, it’s always nice to have an extra to keep handy so you can treat your lips whenever needed!